If you went into Dr. Frankenstein’s laboratory and could create the perfect funder (and get rid of the crazy, psychotic tendencies of the original Frankenstein Monster) the end result would look very close to the three trustees of the Mukti Fund. The Mukti Fund is a small private foundation with a domestic program in Queer Youth Theater and the three trustees Mike, Weston and Martin are amazing. These funders have been amazing. About four years ago, I got an email on my playwriting website asking me to forward an article I had written about Queer Youth Theater Groups for TYA Today. The email was from Mike Dively who decided to start offering VERY generous grants to queer youth theater groups: theater groups who work with gay, lesbian, bisexual, transgender, questioning and straight allied teens and also groups who tour shows with young professional actors into the schools about LGBT bullying and safety. The initial grants ranged from $5,000 to $15,000; a huge windfall for small queer youth theater groups (and there aren’t that many of us). 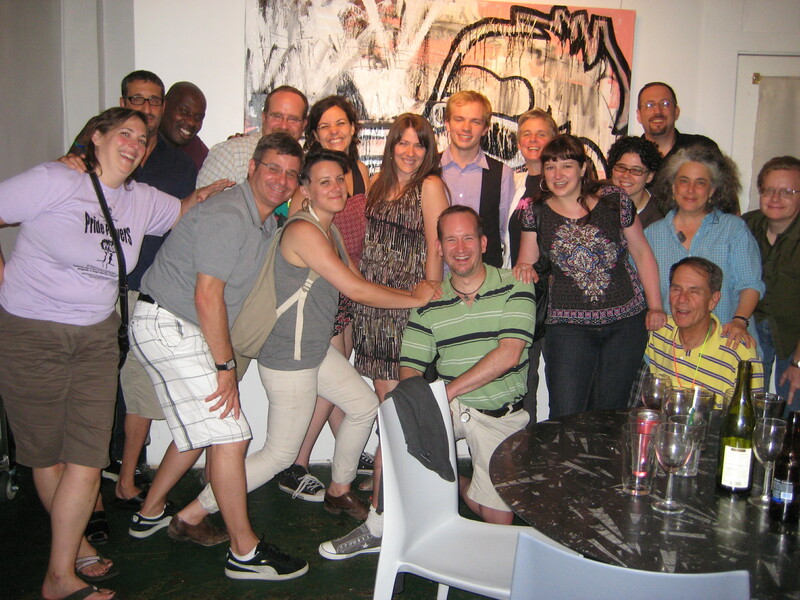 The trustees even hosted a queer youth theater retreat for us last summer in Orlando. With this retreat, they provided an amazing opportunity to network, present our work, and discuss important issues in our work. The Omaha Theater Company hosted the second annual Queer Youth Theater Director retreat on July 21-24th, 2011. Directors from Los Angeles, San Bernadino, San Fransisco, Madison, Ann Arbor, Chicago, Omaha, Pittsburgh, New York City, Boston and Portland (ME) met for a weekend of workshops, networking, theater game shares, and celebration of our work. Mike, Weston and Martin attend the retreats: getting to know each of us personally and learning more about our work. They listen to our concerns and brainstorm the most effective way their foundation can support our work. They participate and challenge us, but never dictate the direction of the discussions. These retreats are inspiring and so supportive. The Mukti Fund has validated our work and helped us celebrate our accomplishments. They have also allowed us to dream big: collaborations, expanded touring, book publications, and staff additions. I couldn’t ask for anything more from them as funders. The Mukti Fund is committed to helping other theater groups start their own queer youth theater groups. As TYA professionals, we know the power of theater to make a difference in young people’s lives. The Mukti Fund is committing money and resources to expand the opportunities for LGBT and allied teens. If you are interested in more information about the opportunities to start your own queer youth theater group, contact me at briang@rosetheater.org.